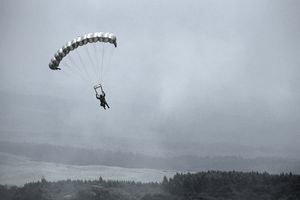 Army Parachutist badges are awarded to Airborne personnel based on criteria training, service, and the number of jumps. The badges have both wings and a parachute and are often called Jump Wings. Awarded to individuals rated excellent in character and efficiency who have participated in 65 jumps to include 25 jumps with combat equipment; four night jumps, one of which is as a jumpmaster of a stick; five mass tactical jumps which culminate in an airborne assault problem with a unit equivalent to a battalion or larger, a separate company/battery, or organic staff of a regiment size or larger; graduated from the Jumpmaster Course; and served in jump status with an airborne unit or other organization authorized parachutists for a total of at least 36 months. Awarded to individuals rated excellent in character and efficiency who have participated in a minimum of 30 jumps to include 15 jumps with combat equipment; two night jumps, one of which is as jumpmaster of a stick; two mass tactical jumps which culminate in an airborne assault problem; graduated from the Jumpmaster Course; and served in jump status with an airborne unit or other organization authorized parachutists for a total of at least 24 months. Awarded to any individual who has satisfactorily completed the prescribed proficiency tests while assigned or attached to an airborne unit or the Airborne Department of the Infantry School, or participated in at least one combat parachute jump. The Parachutist Badge was formally approved on 10 March 1941. The Senior and Master Parachutist Badges were authorized by HQDA in 1949 and were announced by C-4, AR 600-70, dated 24 January 1950. Subdued badges are authorized in metal and cloth. The metal badge is black. The cloth badge is of olive green base cloth with the wings, parachute, star, and wreath embroidered in black. Dress miniature badges are authorized in the following sizes: Master: 13/16 inch in height and 7/8 inch in width; Senior: 5/8 inch in height and 7/8 inch in width; Parachutist: 15/32 inch in height and 7/8 inch in width.